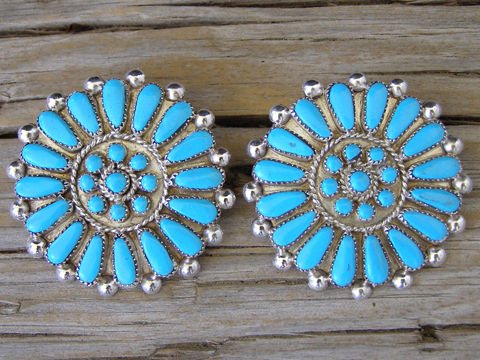 This pair of Zuni needlepoint earrings is set with stones of stabilized Sleeping Beauty turquoise from Arizona which was cut for these earrings. Because this turquoise is stabilized, it will not change color over time. Each post earring is set with 25 stones; nine rounds in the center surrounded by sixteen teardrop-shaped stones. Hallmarked Zuni and marked K T on the back. Stones: 9 rounds 3/32" diameter; 16 teardrops 5/16" x 1/8"